Yesterday evening, I got into a discussion with a friend of mine about the fierceness of the Aztecs as compared to the Mayans. Unfortunately, it was during an intermission at a Christmas concert which was about to start up again before we came to any resolution. So I decided to marshal my arguments here in print. Some years back, I attended a symposium at UCLA including two eminent Mesoamerican archeologists, Michael D. Coe and Nigel Davies. At one point in the discussion, they mused whether they would rather be prisoners of the Aztecs or the Mayas. Both quickly agreed that they would fare better with the Aztecs. After all, they fearfully accepted Cortes and his conquistadores despite the fact that they outnumbered his forces by thousands to one. Also, the Aztecs were an empire: If the emperor (Moctezuma) said the Spanish were welcome, then the welcome mat was unrolled for them everywhere in the empire. The Maya, on the other hand, lived in decentralized city states which, in the Postclassic period, were ruled by merchants and nobles. If Tiho (present-day Merida) accepted the Spanish—which they most certainly did not—there were other Maya city states nearby such as Mayapán, Cobá, and Calakmul which may or may not. The Maya were never unified. Even today, there are some twenty-eight Mayan dialects among the eight million Maya living in Mexico, Guatemala, Belize, Honduras, and El Salvador. Cortes didn’t take long to conquer the Aztecs, only about a year or two. After that, the Aztec culture went into a precipitous decline. Today, there are few speakers of the Nahuatl language around, and few Aztec religious rituals practiced by those Nahuatl speakers. The Maya were eventually conquered by the Spanish, but only after almost two hundred years of warfare. In 1697, Martín de Ursúa y Arismendi attacked the last Maya sate, Tayasal, with hundreds of Spanish troops and native auxiliaries. The Maya were a tough people. Imagine the lives led by their god/kings. On certain ceremonial occasions, they punctured their tongues or their penises with sting ray spines and let the blood drip onto pieces of paper which they sacrificed to the gods. 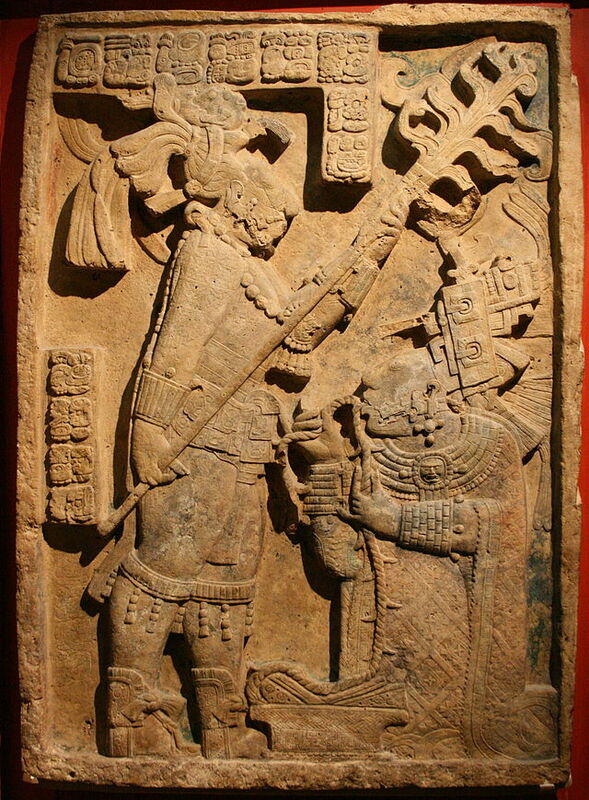 And the various Maya polities frequently fought wars with one another. When a king lost, he was sacrificed in a bloody ritual. The Aztecs also went in for human sacrifice, but the Maya have been known to resort to cannibalism of their victims. I think that Coe and Davies were right: You’d have a much better chance of surviving with the wavering Moctezuma than with the Maya. In the Catholic liturgy, today is All Souls’ Day, which the Mexican culture has enriched with its Dia de los Muertos, the Day of the Dead. 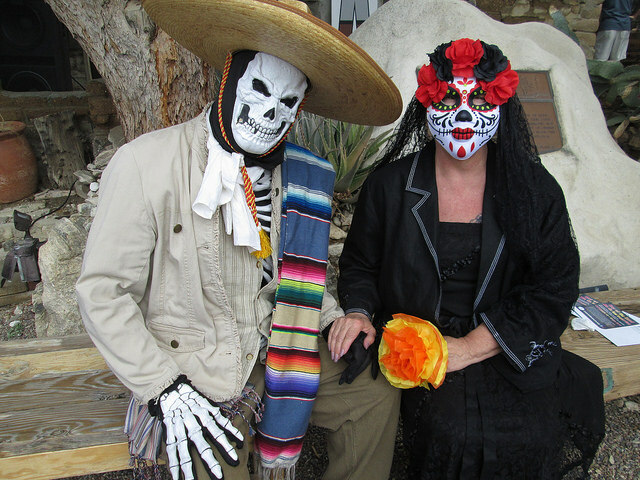 The Mexican feast day is much healthier than our own Halloween: Families go to the cemeteries with a picnic lunch, which they eat by the grave of their loved ones. Years ago, I was on a bus between Mazatlán and Durango on November 2 with a number of villagers headed to celebrate. The bus was full, so I helped a young mother hold her baby from time to time as she tended to her other children. We see death as an embarrassment, some kind of failure. Too bad, because we all die; and that death is part and parcel of our lives. We deny it at our own risk, because when we least expect it, to springs out like a jack-in-the-box and catches us all unawares. One of the strengths of Mexican culture—and I believe there are many—is that people do not try to sweep the inevitable under the rug. 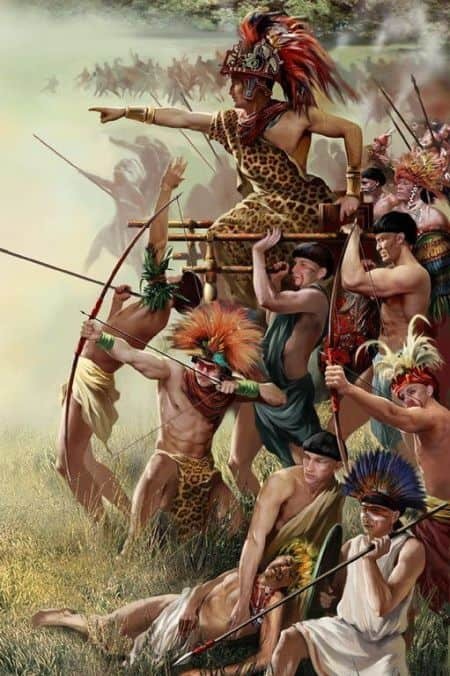 The Aztecs and Maya used to fight wars among themselves and their neighbors for the sole purpose of capturing prisoners who were sacrificed to the gods. At Chichen Itza, there was a large platform called the Tzompantli, or Skull Rack, to hold a pyramid of skulls of these sacrificial victims. There were a number of grisly rituals connected with these sacrifices, such as cutting out the heart of victims with an obsidian knife and kicking the body down the pyramid steps, skinning the victims and having the priests wear the skins. There was even some cannibalism. Eventually, with the Spanish invasion, these rituals were suppressed; but the celebration of life’s fragility became a part of the culture. Maybe this is what Trumpf is afraid of by these “invasions” from Latin America. He’s afraid for his own head, perhaps. They can have it. We tend to think that the only advanced Pre-Columbian Civilizations were the latest. For Mexico and Central America, that would mean the Aztecs and Mayas; for Peru, the Incas. As one who has traveled to Mexico many times to see archaeological sites, I can vouch for the fact that, long before the Aztecs left their mythical homeland of Aztlán, there were other civilizations in Mexico that they replaced, but which they did not necessarily improve upon. The peoples who built Teotihuacan north of Mexico City did it around a hundred years before the Christian era. 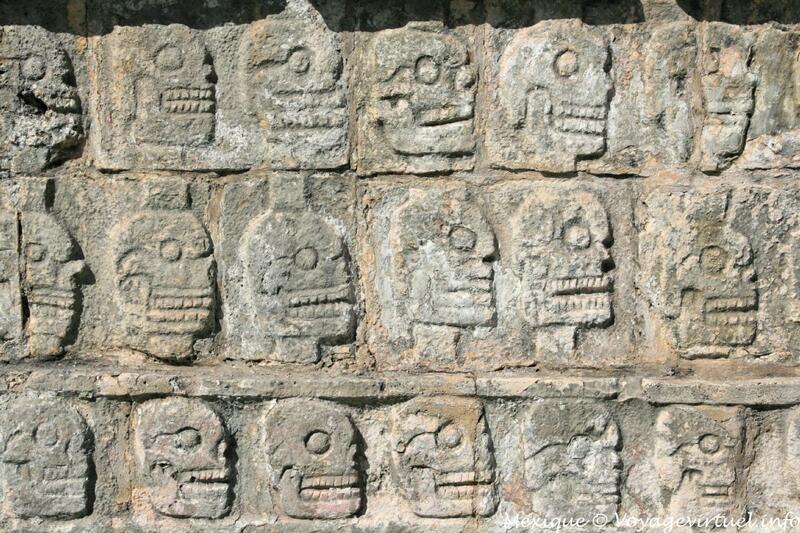 Then there were the Toltecs, the Totonacs, the Olmecs, and the Huastecs. I have seen remains from these and other Meso-American civilizations over a thirty-year period. The Mayans are slightly different: They were less a centralized political entity than a people who have been around for thousands of years and lived through both empires and more localized city states and leagues of city states. The last Mayans were conquered by the Spanish at Tayasal in 1697, representing a much thornier military target for the conquistadores than the Aztecs. They built a great paved road system covering some 25,000 miles. (But since these roads included steps at times, they could be navigated by sure-footed llamas, but not by the Spaniards’ horses). They were great builders who, in a major earthquake zone, erected structures that are still standing. Prior to the Incas, there were numerous Peruvian civilizations who bettered the Incas in many respects. 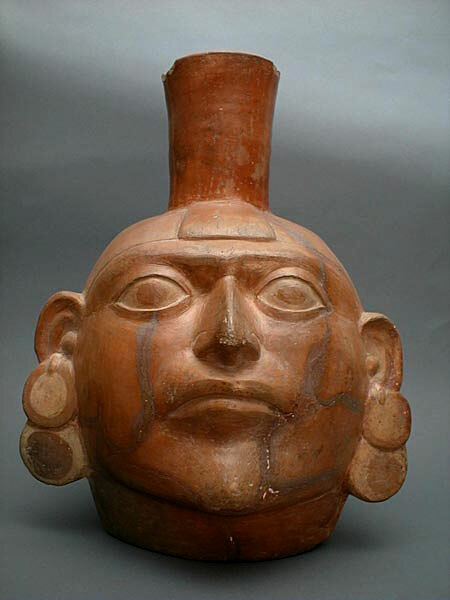 The Moches or Mochica of the north were just one example: Their pottery is far more artistic (see above photo) than anything the Inca were able to create. Then, there were the Wari, the Nazca, the Chavin, Tiwanaku, Chincha, Chanka, and Chimu. 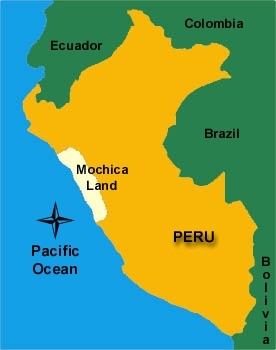 My upcoming trip to Peru will include some visits to non-Inca ruins, such as Huaca Pucllana of the indigenous Lima culture and Pachacamac of the Ichma people. If it weren’t for the fact that I’ve never been to Peru before—and I don’t know whether I can go again—I will concentrate mostly on the Inca sites of the Sacred Valley between Cusco and Machu Picchu.